The aim of this guide is to outline the appropriate legislation associated with the supply of venison and specifically clarify the different obligations imposed by the Deer (Scotland) Act 1996 and the Food Hygiene Regulations. This guide also provides information on ways to add value to the venison product and maximise profit through venison sales. Food Safety Act 2002	 Lays down the general principles and requirements of food law and procedures in matters of food safety, including establishing traceability of food, feed and food producing animals. Food Hygiene Regs 2006	 These set out the basic hygiene requirements for all aspects of your business, from your premises and facilities to the personal hygiene of your staff. One of the key requirements of the law is that you must be able to show what you do to make or sell food that is safe to eat. Deer (Scotland) Act 1996	 The Deer (Scotland) Act requires an individual who sells, offers or exposes for sale the carcass of a deer or any part of a carcass, must hold a Venison Dealer’s Licence unless venison is being sold directly to or bought directly from a LVD. Licences may be granted by councils to any person regarded as being fit to deal in venison. The following scenarios provide a summary of the venison producer’s responsibilities in the most common situations. No restrictions on amount of carcasses sold. 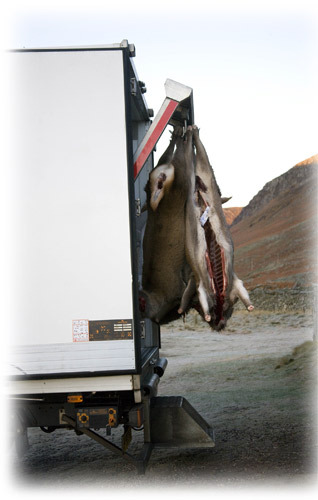 A venison dealer’s licence is not required, provided the operator of the AGHE is a LVD. Note any abnormal behaviour before culling. A carcass must be inspected by a ‘trained’ person after death for abnormal signs of disease, parasites or contamination. Holding an approved qualification such as updated DSC Level 1 or the Level 2 Certificate in Game Meat Hygiene, is the most robust way in which stalkers can show that they have the appropriate knowledge to be considered “trained”. A declaration tag must be signed by a trained person (available from the licensed processing plant). Keep records that ensure traceability. Should return records of deer culled to Scottish Natural Heritage (Section 40 Deer (Scotland) Act 1996). A carcass should reach the processor as soon as possible. 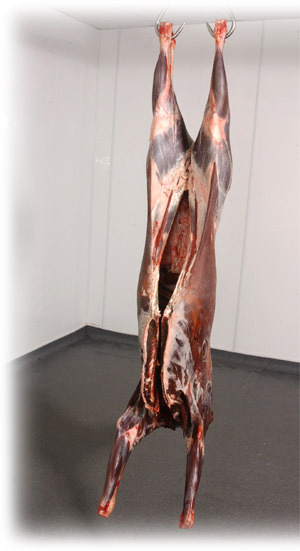 Keep the carcase free from contamination throughout the whole process. It is the responsibility of the producer to ensure they know that any food they produce is to be handled in accordance with the law in the next stage of the food production process. Carcass core temperature should be brought down to 70C as soon as reasonably possible and be kept below this temperature. Access to a chill will be required in most cases. For both the carcass and the larder, the producer must fulfil HACCP* (Hazard Analysis Critical Control Point) requirements demanded by the Venison Dealer. Hazard and Critical Control Points (HACCP)	 The HACCP system* is internationally accepted as the system of choice for food safety management. It is a preventative approach to food safety based identifying hazards and critical control points, and establishing, verifying, reviewing and recording food safety procedures and measures. Larder Premises used for keeping killed wild game, where primary products are stored prior to onward transport or processing. Approved Game Handling Establishment (AGHE)	 An establishment for processing wild game for general sale both within the UK and for exports. Approved by the Food Standards Agency. Licenced Venison Dealer (LVD)	 In Scotland, any persons wishing to sell large wild game require to be Licensed Venison Dealers (Deer (Scotland) Act 1996, unless they are selling directly to or purchasing directly from a LVD. A “licensed venison dealer” means the holder of a Venison Dealer’s Licence granted by the Local Authority within whose area the sale, offer or exposure for sale takes place, or where the premises concerned are situated. Local Supply	 “Local” refers to local authority area, neighbouring local authority or a radius of 50km which ever is greater. Also includes mail order and internet sales to the final consumer wherever they may be sent. Small Quantities	 Has no absolute figure set as quantity will be self limiting. Sale Under Section 36 (7) of the Deer (Scotland) Act 1996, the term “sale” includes barter, exchange and other transactions by which venison is disposed of for value. Venison In sections 33, 34 and 36 of the Deer (Scotland) Act 1996, “venison” means the carcase or any edible part of the carcase of deer, and “deer” means deer of any species, and includes farmed deer. Food standards legislation requires that anything put into the food chain must be safe to eat. Can only supply small quantities. Can not process the carcasses beyond gralloching, removing the head & feet and removing the pluck. Can only supply to a final consumer or supply to a retailer (that is itself supplying a final consumer) who is in the same or neighbouring local authority area or is within 50 km radius of the producer’s property, whichever is the greatest. If selling the carcass other than to a Venison Dealer, then must have a Venison Dealers Licence* obtained from the Local Authority. Must return cull records to SNH and maintain records of venison traded, the latter to be made available for inspection by SNH (Sections 40 & 34, Deer (Scotland) Act 1996). Premises will need to be registered with Local Authority. Will not need to have a HACCP system, but it is recommended that they apply HACCP principles as far as possible. Can only supply small quantities to final consumer. Must implement general hygiene principles laid out in the Food Standards Regulations. Can only supply to a final consumer or only supply to a retailer (that is itself supplying a final consumer) who is in the same or neighbouring local authority area or is within 50 km radius of the producer’s property whichever is the greatest. If selling the venison, then must have a Venison Dealers Licence obtained from the Local Authority. Return cull records to SNH and maintain records of venison traded, the latter to be made available for inspection by SNH (Sections 40 & 34, Deer (Scotland) Act 1996). Larder must be registered with the local authority. Follow general hygiene principles laid out in the Food Standards Regulations. For both the carcass and the larder, the producer must have a HACCP (Hazard Analysis Critical Control Point) plan in place. * Carcass core temperature should reach 70C as soon as reasonably possible and be kept below this temperature. Access to a chill will be required in most cases. Must ensure that the cold chain is maintained throughout the whole process of supply (ie the temperature of the meat is never allowed to go up after being chillled). Ensure that processed and unprocessed meats are effectively separated to avoid contamination (eg. by adequate space in the chiller, separate processing area, lardering and processing not carried out at the same time in the same area). According to the Deer (Scotland) Act 1996, an individual who sells, offers or exposes for sale the carcass of a deer or any part of a carcass, must hold a venison dealer’s licence (VDL) (unless they are selling it directly to or have bought it directly from a LVD). To apply for a VDL you must contact your Local Authority. A VDL is valid for three years and is granted only once the Local Authority have satisfied themselves the applicant is suitable. Every Licensed Venison Dealer must keep records of all transactions under the licence. If giving venison as a gift you do not require a VDL. There are several ways in which venison producers may increase income from venison sales. Please note that those selling venison must abide by the regulations as detailed above. There are several examples of producers grouping together to achieve economies of scale. These schemes can also provide a pool of marketing knowledge & experience. There are many possibilities for local sales that may need little or no marketing or delivery costs. Perhaps a local butcher or hotel may provide custom. Local farmers markets should also be considered as an outlet. You may wish to consider online venison sales as a way of keeping marketing and transport costs to a minimum, although this will require a large supply of venison. You should consult with the Food Standards Agency before beginning this practice. If considering using mail order sales, then consult with your Local Authority Trading Standards1 Officer in the first instance. Membership of SQWV provides customers with assurance that Scottish wild venison has been produced to an established industry standard. Quality assurance creates a positive message about stalking and wild venison and is evidenced by the SQWV quality mark. Membership of this scheme indicates compliance with a comprehensive set of standards as to how carcasses should be handled. The scheme also provides guidance on larder design and fitting out. All larders are assessed as a part of the SQWV application process and improvements are stipulated if necessary to meet SQWV requirements.